WASHINGTON — Americans bought new homes in May at the fastest pace in more than two years. The increase suggests a modest recovery in the housing market is continuing, despite weaker job growth. The Commerce Department said Monday that sales of new homes increased 7.6 percent in May from April to a seasonally adjusted annual rate of 369,000 homes. That’s the best pace since April 2010, the last month that buyers could qualify for a federal homebuying tax credit. Even with the gains, the annual sales pace is less than half the 700,000 that economists consider to be healthy. Yet the increase follows other signs that show the housing market is improving nearly five years after the bubble burst. Builders are slowly gaining confidence in the market and starting to build more homes. Mortgage rates have plunged to the lowest levels on record, making homebuying more affordable. Prices remain low and have started to stabilize. And sales of previously occupied homes are much higher than the same time last year. Though new homes represent less than 20 percent of the housing market, they have an outsize impact on the economy. 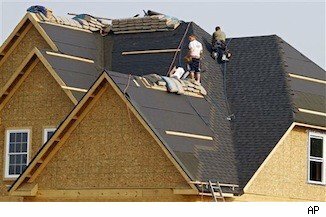 Each home built creates an average of three jobs for a year and generates about $90,000 in tax revenue, according to the National Association of Home Builders. One reason prices could rise is that the supply of new homes for sale remains extremely low. Just 145,000 new homes were for sale in May. That’s not much higher than the 144,000 available in April, which was the lowest on records dating back to 1963. At the current sales pace, it would take 4.7 months to exhaust the supply, well below the six-month supply that is generally considered healthy by economists. “With no excess inventory of unsold new homes, any sustained rebound in new home sales should quickly translate into firmer prices,” said Steven Wood, chief economist at Insight Economics. The median price of a new home sold in May edged down 0.6 percent from the April to $234,500. But the price was 5.6 percent higher than the same month one year ago. Builders are responding to the low supply. In May, they requested the most permits to start construction on homes and apartments in 3&frac12; years. The gains in new homes sold were concentrated in two regions of the country last month. Sales surged 36.7 percent in the Northeast and 12.7 percent in the South. Sales fell 10.6 percent in the Midwest and were down 3.5 percent in the West. Sales of new homes are increasing despite a sluggish job market, which has slowed retail spending and business investment in computers and machinery. Some economists warned that the weaker job market has also started to affect some home sales. Sales of previously occupied homes fell in May to a seasonally adjusted sales rate of 4.55 million after nearly touching a two-year high in April. Still, re-sales have risen 9.6 percent from the same month last year. Hiring slowed sharply in April and May, raising concerns about the strength of the recovery. Employers have added an average of only 73,000 jobs a month in April and May. That’s much lower than the average of 226,000 added in the first three months of this year. Copyright 2012 The Associated Press. The information contained in the AP news report may not be published, broadcast, rewritten or otherwise distributed without the prior written authority of The Associated Press. Active hyperlinks have been inserted by AOL. Find foreclosures in your area. Find homes for rent in your area. Copyright © 2009 Honolulu Mortgage Stars. All Rights Reserved.